Looking for a sport for you dog? Does your dog love the water and love to retrieve? Then DockDogs is the sport for your best friend. Is your dog is cautious around bodies of water or their retrieval isnt so reliable? DockDogs training aims to increase their confidence and play drive! DockDogs training is all about positives, positive attitude, environment, play and interactions. Treat your dog the sameway you would like to be treated around a pool, no body wants to be pushed in. Pool safety is paramount, around it, in it, getting in and out. One of the key aspects our clubs like to train dogs is safety in and out, knowing exit points and confident swimming. Your local clubs are all made up of volunteers, we all enjoy the social aspects and encourage healthy sport activities. Visit local club training session or Social Splash and talk the people who do it. 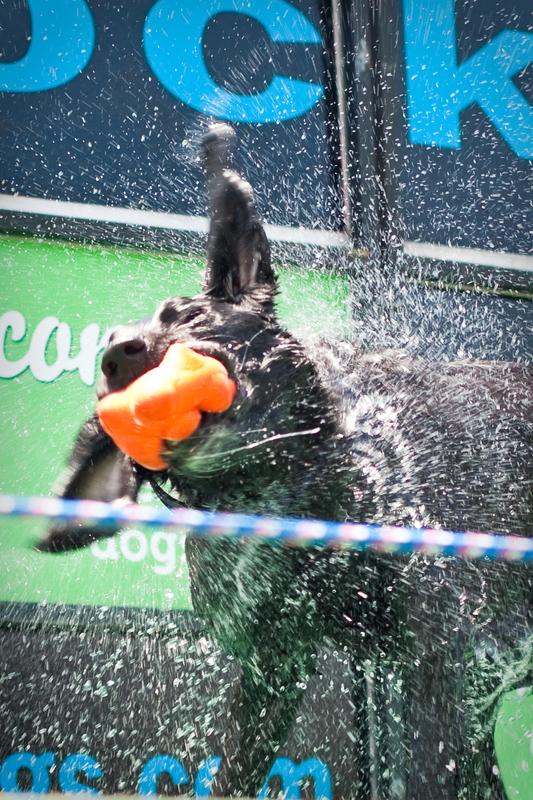 When DockDogs puts on a demonstration or competition, it becomes a show people love. You can view club, inter-club and DockDogs Australia National Competitions or demonstrations. There are various local clubs around Australia, some operate with sanctioned DockDogs Pools, others in rural areas use Dams and other clubs provide training out of their domestic swimming pools. You can locate your nearest club and ask about visiting at the next training. Currently there are 3 clubs around Sydney, two in Qld, two around Melbourne and one in Perth. Please have a look at our list to find your nearest club. Also consider starting your own with our help! Your local clubs are run by volunteers and some training methods may vary (due to the vast methods of training animals) but the goals remains the same. Remember to take your swimmers and clothes you wont mind getting wet. A towel for your dog and probably for yourself as well. A toy that is floatable, retrievable and never had been alive (or still is living, definitely a no no on that). Outside of the dock fence area, your dogs need to be on a lead at all times and keep at a least 2 meters distance between. Inside the dock/pool area, follow your DockDogs members instructions. On your first visit, most dogs will be distracted with a new environment, we recommend patients. Also remember, do not force your dog into the water by physical means (No pushing, tugging, spanking, kicking, nudging, elbowing, head-butting, etc etc. You may be banned) Emotional blackmailing your dog into the water is also frowned upon. We aim to show the fun we have jumping into pools and playing with toys. Some of us were hesitant originally when we learnt to swim and most of us really, really enjoy it now. Knowing how to swim and safely jump into water is an important skill to posses.